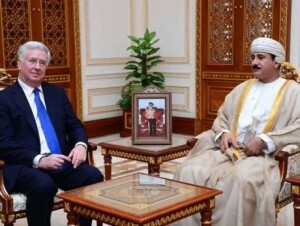 British Defense Minister Michael Fallon said there are plans to have a permanent naval force stationed in Oman and a Memorandum of Understanding was signed between UK’s Babcock International Group and Oman Drydock Company to build the base near Duqm port, at an estimated cost of around $110 million. Oman is known for its impartiality in regional crises and has usually served as a deal broker between states in the region. Oman “occupies a key strategic position in the region” and the UK is “committed to helping the country in case of any threat,” he said adding that the permanent base would further facilitate such actions. He also wants stronger naval and air force ties between the two countries as training exercises between their militaries have been limited to the land. The UK is interested in having a general defense cooperation which goes beyond selling weapons. The defense minister was speaking at a press conference held at the residence of the UK ambassador in Muscat where he had met several senior Omani officials. Written by: Peter Mulvany on April 1, 2016. Posted by Peter Mulvany on Apr 1 2016. Filed under Headlines, World News. You can follow any responses to this entry through the RSS 2.0. Both comments and pings are currently closed.